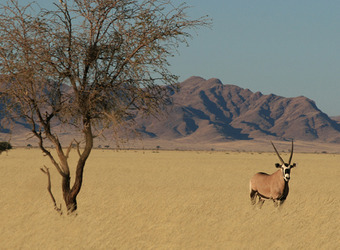 Etosha offers the most dense wildlife viewing in Namibia. The best way to experience it is on early-morning and late-afternoon wildlife drives by open 4x4 vehicle, both inside Etosha National Park and adjacent to it in private game reserves. Within the private reserves, night drives in search of nocturnal wildlife, as well as nature walks, are possible. Terrain changes quickly from mopane woodland to tamboti and terminalia woodland in the east, and acacia-strewn grasslands and savanna to the west. The Etosha salt pan is a vast, moon-like surface in the middle of the park, in complete contrast to the wooded areas surrounding it. The Ondundozonanandana Range, a row of dolomite hills, adds interest to the otherwise flat terrain. Most animals can be seen coming to waterholes to drink, since the park is otherwise quite arid, or grazing and foraging in the grassy and wooded areas. An impressive variety of wildlife is on view here. 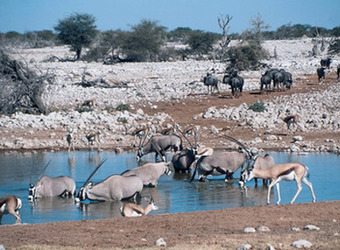 In the easily accessible Okaukuejo area of Etosha National Park, visitors are likely to see elephant, lion, gemsbok, red hartebeest, wildebeest, and both black and white rhino. Also present are leopard and cheetah. The large waterholes draw herds of Burchell’s zebra, Hartmann’s mountain zebra, springbok, giraffe, elephant, black-faced impala and so much more. 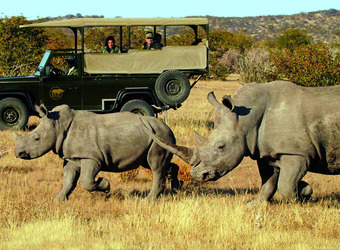 Tracking rhino on foot in the private reserves is a thrilling addition to any safari. In the wooded areas, birdlife flourishes, with 340 species on the Ongava Private Game Reserve, including 10 of the country’s 14 endemic species. Ostrich are easy to find throughout the area, as well as large kori bustard and raptors. Special sightings include the violet wood-hoopoe, the Namaqua sandgrouse, Hartlaub’s francolin, the sociable weaver with its giant nests, the bright and beautiful crimson-breasted shrike and the miniature Pygmy falcon, to name a few. For wildlife enthusiasts, Etosha is complemented well by a visit to Okonjima to participate in cheetah and other large feline conservation and rehabilitation efforts. The wildlife of the Okavango Delta expands the experience with different antelope, birdlife, Cape buffalo and many of the same species existing in a completely contrasting environment. For a more complete Namibia experience, visit the ecosystems that line the Namib Desert, from the dunes of Sossusvlei to the Damaraland with its desert-adapted wildlife, and the vastness of the Hartmann Valley. South Africa’s Kruger Park and Cape Town add yet other dimensions with “Big Five” game viewing and the colorful cultures, food, wine, and abundant marine wildlife of the Cape. 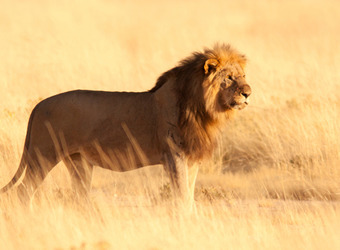 When did you visit Etosha Nat'l Park?